USS Princeton was commissioned in 1989, she marked a new development in the Ticonderoga class of guided missile cruisers, with upgraded Aegis radar system and vertical mount launchers. Ships of this class are still in service: a Google search will produce plenty of information and photos. Princeton also has a page in Wikipedia. The model comes in a reasonably sturdy end-opening box. Moulded in light grey plastic, slight sink marks appear in the hull sides near the bow, otherwise no flash or other flaws were seen. The model is 138mm long (5.4inches) which is exactly correct at 1:1250 scale, overall proportions look right to me. Detailing looks good, on the decks and superstructure, bearing in mind the small scale, the gun barrels are particularly fine. The masts are "solid" but the lattice structure is raised so that it can easily be painted a different colour from the "gaps". 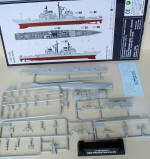 The kit comes with a hull bottom detachable at the waterline, making a waterline model will involve trimming the ends off the locating pins inside the hull. The assembly instructions have no sequence indicated. Some care will be needed in locating the antennas correctly, since there do not appear to be any locating pins or marks. The modeller needs to be careful to paint and apply decals before the gun mounts are attached. The box bottom plan indicates colours and placement of the markings. No helicopter is included, aftermarket SH-60s are available in this scale in cast metal, possibly more expensive than this kit. Aftermarket PE railings are also available in this scale, as far as I know there is no PE mast available commercially, yet. 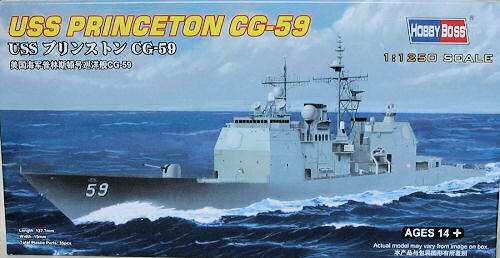 Hobby Boss has released Kits in 1:1250 scale of three ships in the Ticonderoga class: Ticonderoga, Vincennes and Princeton. Each boxing have some different plastic parts: missile launchers, masts, antennae, as appropriate, as well as different decals. So if you are interested in having a little fleet there is a point in buying all three kits. I hope that these kits will help to introduce new modellers to the sphere of 1:1250 scale ship collecting, and also perhaps persuade a few collectors to try making kits. There are very few plastic kits in this scale or the very similar 1:1200 scale. 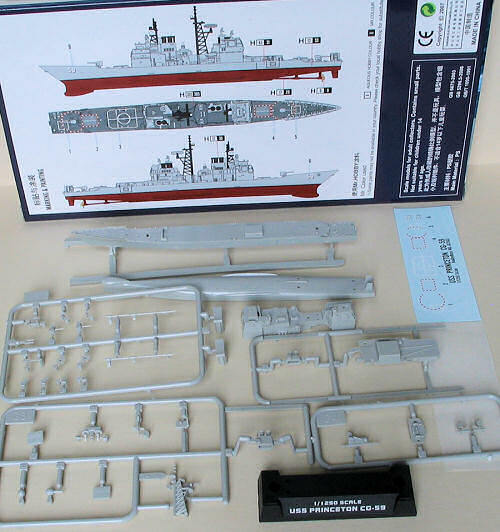 By contrast are thousands of cast metal ship models currently available in these scales, also hundreds of metal and resin kits. I bought my kit from Martin Brown at a 1:1200 collectors' meeting, he has a website specialising in 1:1250 scale ship models http://waterline-ships.co.uk/. No doubt they are also available from Hobbylink Japan and other internet websites. I haven't seen them in the shops in the UK, but have heard that they can be found.